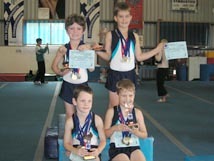 For up to date news on our team gymnasts adventures please see our Facebook page (LAAG Brag). Please read our Social Media Policy. We all value excellence in competition performance - however we often fail to acknowledge & recognise the personal attributes that lead to success not only on the competition floor but also in the development of an outstanding young citizen of the future. The gymnast of the year trophy is presented annually to publicly recognise the girl or boy who through their personal qualities & characteristics act as fine examples for our younger gymnasts & the gymnastic community at large.